Whether you’re working in fine art painting, still photography or cinematography there is one discipline that unites all of the great art throughout history: Lighting. You can’t create an image without it. This two day workshop is for filmmakers, cinematographers, still photographers, VFX artists, gaffers, grips, electricians and anyone involved in moving images who wishes to understand the fundamentals of lighting. This class will give you the confidence to work on real world sets by covering all of the most widely used grip and lighting equipment as well as delving into the philosophy and psychology of the art and craft of lighting. Friday November 23rd we will start by having a 2 hour orientation from 7pm to 9pm. After class introductions we will discuss our goals for the weekend. On Saturday morning at 9am we will start by covering the names of all of the most widely used grip and lighting gear.Then we will cover safety procedures when working with electricity and grip equipment. After that the class will go hands-on and allow you to learn the finer points of setting stands, shaping light and working with HMI, tungsten, fluorescent and LED lighting instruments. Day 1 will also include a camera demo with an HDDSLR. Topics discussed will include t-stops, exposure, footcandles, color and lenses. We will also talk about getting the most out of your images in post-production. Time and availability permitting the class may include a demo with the RED Epic. Day 2 will be almost entirely devoted to lighting exercises. We will be both in and out of the studio, lighting car interiors, interviews, a beauty light, day exteriors and dramatic interiors. Plan on spending (2) 10+ hour days receiving intensive lighting instruction. Tuition for the workshop is $199 + tax. This includes a catered lunch on Saturday and Sunday, drinks and snacks throughout the workshop, a free Death Grip t-shirt and 25% off your next Death Grip equipment rental. 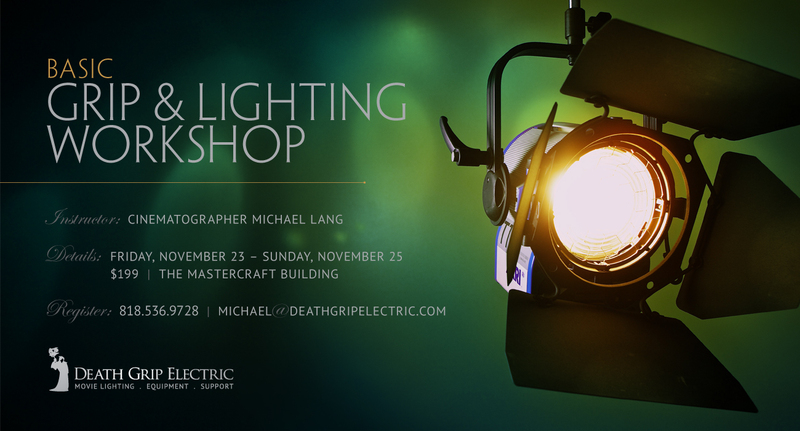 Michael Lang of Death Grip Electric will be the lead instructor. Space is limited. Reserve your spot today. ~ by Michael Lang on October 19, 2012. This entry was posted on October 19, 2012 at 12:14 am and is filed under Announcements, Workshops.You can follow any responses to this entry through the RSS 2.0 feed.You can leave a response, or trackback from your own site. Next: Intermediate Location Lighting Workshop Nov 30 – Dec 2!